Door hangers are a critical political campaign tool. Take advantage of this powerful medium and get your message out there. We offer a wide variety of styles and sizes. 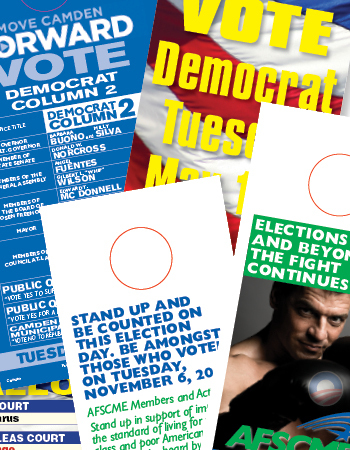 Trenton Printing's affordable custom door hangers can be seen throughout Mercer County NJ and Bucks County PA in the days leading up to the primary and general elections. We can supply you with a door hanger to fit any budget. Rush service available. We offer: Single Color Door Hangers, Spot Color Door Hangers, Full Color Door Hangers, Stock Door Hangers, Custom Door Hangers, Oversize Door Hangers, Union Label Door Hangers, Foldover Door Hangers, Perforated Door Hangers, Digital Door Hangers and Offset Door Hangers. Looking for something even more personal? Get the conversation started with a PALM CARD or WALK PIECE.